OCC POs Oliver Solanas Heinrichs and Mike Westin have announced the third Viking Explorers Rally from Gran Canaria to St. Vincent and the Grenadines. Mike Westin and Oliver Solanas Heinrichs wrote the ’Cruising Guide to the Canary Islands’ together and now arrange the Viking Explorers friendly rally across the Atlantic. For the second year, the rally will land in Saint Vincent and the Grenadines. 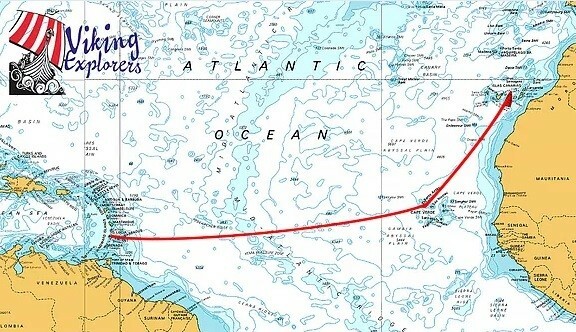 They will remain in the Grenadines for a month to write articles for the European boating press, helping to develop tourism to the islands. The participants are keen cruisers who agree with the rally’s ethos of helping each other as much as possible — from first aid lectures to lending special tools. This is a low cost option for cruising in company across an ocean. If cruisers want to be served everything, there are commercial alternatives that may suit better. Participating boats are in the 34-44+ foot range and a significant proportion of the skippers/crew are in their late twenties who are out on a gap year before getting kids, a house, and a Volvo. That said, the oldest skipper is 73, and the crew is even older, but Richard Fellows on "Elemiah del Mar” agreed to being "young at heart". The third Viking Explorers Rally will start January 5, 2020 in Las Palmas de Gran Canaria. There will be a maximum of about 20 boats to make the experience the best for the participants. Some 13 boats have already preliminarily signed up and there are queries for 2021 — the concept of Viking Explorers seems to be liked by real cruisers wanting to cross the social way.